Born in Nebraska, Rheta Childe Dorr earned a reputation as a disobedient child, sneaking out of the house to attend a suffragist rally held by Elizabeth Cady Stanton and Susan B. Anthony when she was 12. Her parents discovered her actions only after reading in the paper the list of women who had joined the National Woman Suffrage Association. She had used her only silver dollar to pay dues. She later pursued journalism, but was shocked to learn that editors refused to put her on the staff simply because she was a woman. While covering the coronation of a new king in Norway, she became acquainted with prominent British suffragists. She later decided to go underground to learn and write about the experiences of everyday workers, later learning that her stories were given a male byline. In 1910 she wrote, “What Eight Million Women Want” about suffrage clubs, trade unions, and consumers leagues in Europe and the United States. That led her to assisting British suffragist, Emmeline Pankhurst, in writing Pankhurst’s autobiography, “My Own Story.” She was selected to be the editor of the new weekly suffrage newspaper, “The Suffragist,” the first of which appeared on November 15, 1913. It was the official publication of those trying to influence national legislation for the cause. 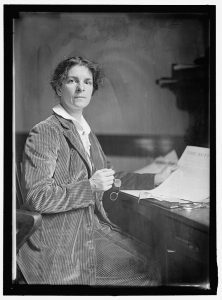 She once explained that the idea of the paper was to bring to the attention of women all over the country that they may have a voice in government by making it a political issue and electing men who are favorable to equal suffrage. She eventually quit her position as editor over frustration over suffragist Alice Paul’s autocratic manner.